An Australian writer contends with the contradictory legacy of his home country’s most famous art critic. 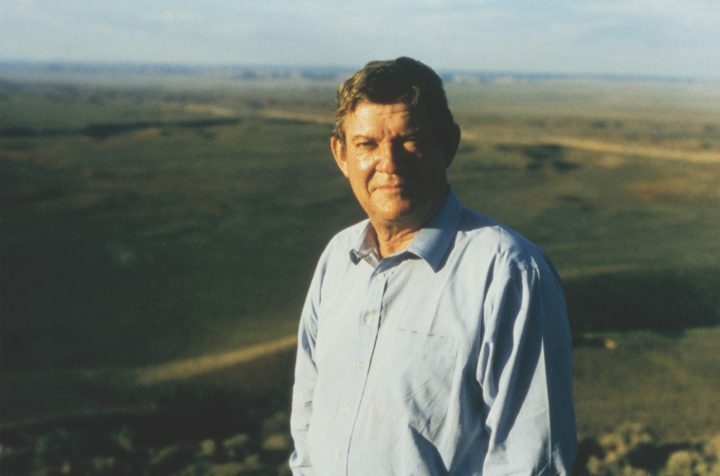 My Dad grew up in Gawler, a country town in South Australia modestly known for a TV show about horse-ranching. He worked as a gravedigger, then studied architecture at Adelaide University, where he was dismissed from classes for wearing tissue boxes on his feet. He enjoyed rushing from the dinner table to consult the encyclopedia, settling an argument between my sister and me, or enlightening us with trivia. He sees great artistry in Rothko, and also Prince, and especially The Simpsons, and he is skeptical of any appreciation of art that adheres to a single theory. Now sixty-five, he recently won Australia’s national architecture award for the third time in four years. Melbourne, the city I grew up in, is literally landmarked with his achievement. I am completely an elitist, in the cultural but emphatically not the social sense. I prefer the good to the bad, the articulate to the mumbling, the aesthetically developed to the merely primitive, and full to partial consciousness. I remember reading that quote when I first picked up The Spectacle of Skill, and promptly closing the book. The question of how exactly Hughes so adamantly distinguishes between these polar terms, or how he “emphatically” separates his cultural elitism from his social outlook, was for me enough to dismiss his critical mind. Just another art-policeman. The book was a gift from Dad after I began to write criticism. I don’t usually reflect on our relationship, too easily tending towards a clichéd resignation that my accomplishments can never be measured against his. It’s the old Oedipal trap: fathers and sons, patriarchy and authority. Is there any notion less fashionable right now, especially in regards to the critical voice? 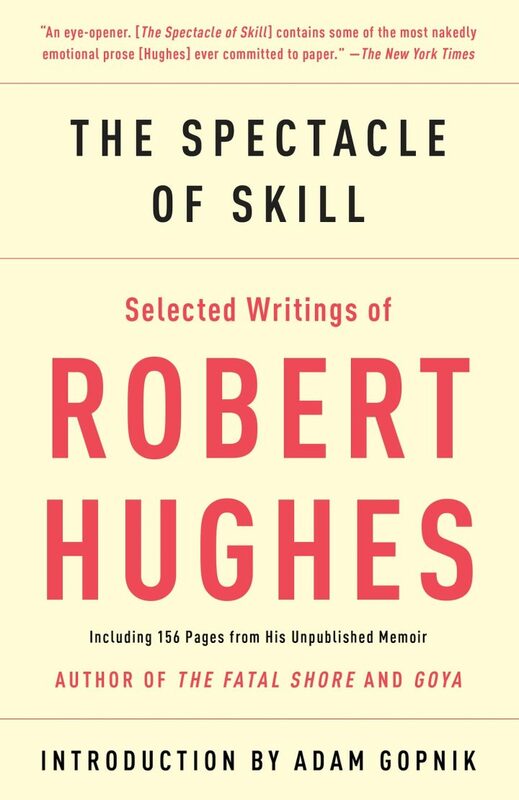 In the introduction to The Spectacle of Skill, Adam Gopnik speaks of Hughes’ “hatred of the mawkishly confessional.” So rather than indulge purely in my own reflections, I will instead indulge in Hughes’. 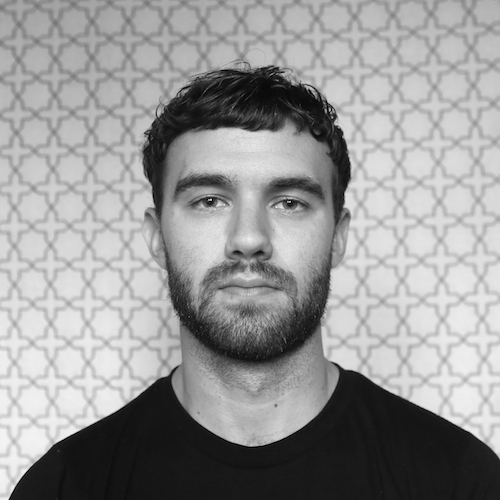 Hughes grew up in Sydney, Australia, remaining fully aware of his Australian sensibilities long after leaving his home behind — an accomplished self-awareness, really, as Australians are practiced at remaining aloof of their cultural character. More precisely, we have a particular disdain for our cultural character, known as Cultural Cringe. is the assumption that whatever you do in the field of writing, painting, sculpture, architecture, film, dance, or theater is of unknown value until it is judged by people outside your own society. It is the reflex of the kid with low self-esteem hoping that his work will please the implacable father, but secretly despairing that it can. The essence of cultural colonialism is that you demand of yourself that your work measure up to standards that cannot be shared or debated where you live. By the manipulations of such standards almost anything can be seen to fail, no matter what sense of finesse, awareness, and delight it may produce in its actual setting. Hughes’ pursuit of this civilization had him moving forever closer to the centers of the cultural world, “where truth and efficacy exceed the merely local”: first to Western Europe, where he meandered in Italy and Spain, briefly settling in London, and then to New York in 1970, where he wrote for Time. Hughes, no doubt drawn to these cultural centers to satiate his critical palate, couldn’t help feeling that New York, even in the 1970s, was no longer the bastion of cultural capital that it had been in the ’60s. “New York,” in his words, “remains a center but not, as the art world used to imagine, the center.” Imagine what he’d think today. Hughes’ feelings about this de-centering were, as with his other opinions, contradictory. On the one hand, he prized the intellectually and aesthetically brilliant, which he graded by his own metric, above all else, and believed that one needed the influence of a cultural center for such quality to flourish. Yet he also had no love for imperially controlled artistic tastes. He wrote of New York’s decline, “one of the positive results will be finally to clear our minds of the cant of cultural empire and, with that, the nostalgia for the lost imperial center. Under the present circumstances a great artist could just as easily — and unexpectedly — emerge from Hungary or Australia.” Being an Australian came with its own contradictions for Hughes, who was disdainful of the country’s shortcomings, yet hopeful for its potential. Gopnik wrote of Hughes that, “he was the sum of his contradictions. The only question worth asking about a critic is if his contradictions come alive on the page. In my days as a younger artist, I would bristle at any critic who so blatantly dictated the terms of technique. Hughes might say that I, like other contemporary thinkers, had “succumbed to the fiction that the value of the so-called academy — meaning, in essence, the transmission of disciplined skills based on drawing from the live model and the natural motif — were hostile to creativity.” We both slip into typical roles: Hughes, too easily falling prey to the adamancy that great technique is the only path to a meaningful experience of art, while I, in my similarly narrow opposition, champion unfettered expression, denying the fact that a sharper, more disciplined line often leads to a broader vision. Despite a penchant for finger wagging and for pedestaling the old male guard — whenever possible Hughes drops a chain of names, “Cézanne, Monet, Seurat, Degas, Matisse, van Gogh, Gauguin, Munch, Rodin,” as shorthand for his art-literacy — flourishes of freshness are embedded in his perspectives, due to his unapologetic frankness. Where he convinces is with his own mastery of the word, crafting sentences as robust and rigorous as the art that stirs him. Hughes’ prose is often like architecture itself, a solid, tangible construction, which, after a first pass, one can wander through again musingly, appreciating the shapely details within the foundation. The “grasp of the earth” or the “hard skin of glass.” Yet Hughes, while appreciating great talent, still indulges the very Australian tendency to see the absurdity within the sublime, the “perversity” of the heard-but-not-seen waterfall. His love for the critical act is palpable in such bright and canny observations. Hughes calls himself an “elitist.” I have no doubt he enjoyed how the label ruffles people’s feathers. “I see no reason to squirm around this,” he wrote, letting the rest of us squirm around it instead. “I am, after all, a cultural critic, and my main job is to distinguish the good from the second rate.” Hard to argue against that, although it’s still tempting to try. Is that all the job entails? Lining art up on a scale? Still, why else should I want to become a cultural critic, if not to stake some kind of authority for myself? Renouncing authority to obtain authority. Again, that Oedipal trap. The Spectacle of Skill (2015) is published by Vintage Books and is available from Amazon and other online booksellers.